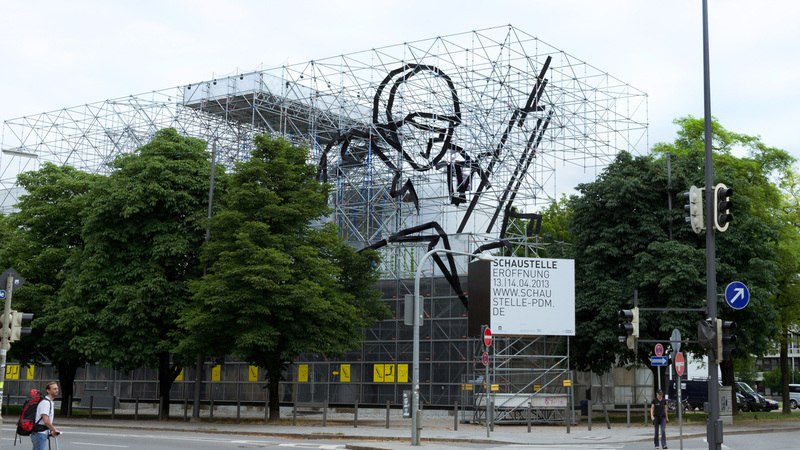 For the Munich artist Tim Wolff (*1976 in Elisabethstadt, Romania) the SCHAUSTELLE’s external scaffolding structure provides an ideal basis for a three-dimensional graphic work. He has discovered a seated figure in the scaffolding’s grid pattern. The work that has developed as a consequence refers back to his wall drawing ‘Kunduz, 2013’ of 2010 and takes it one step further. In the SCHAUSTELLE’s scaffolding a soldier with a gun can be seen sitting, waiting pensively. With his ‘War or Hero Picture’ of 2010 Tim Wolff drew attention to the war in Afghanistan and the German soldiers stationed there. 2013 the three-dimensional graphic work relates to the frustration and resignation of the situation today/ today’s situation. The scaffolding bars wrapped in black plastic sheeting create a three-dimensional image of a seated figure that can only be seen in its entirety from one point – the corner of Gabelsberger and Türkenstrasse. Work on the installation started on 3 June with the help of scaffolding climbers.